The Pinterest Challenge (Spring Edition) is here! 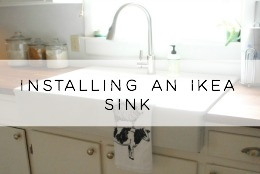 It's time to join in on the pinterest project party fun. 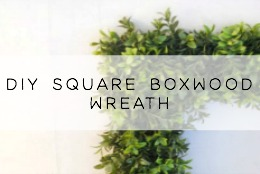 Last challenge I was a guest host (still crazy to me) and put together a diy fabric ottoman. The Pinterest challenge is just a fun way of getting all of us to stop pinning and actually doing! I love it. This time around Sherry and Katie have two new awesome co-hosts Emily and Renee. 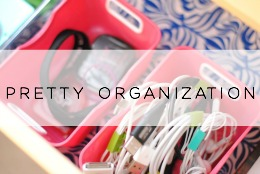 Make sure you stop by their blogs to check out their projects and link up with them! 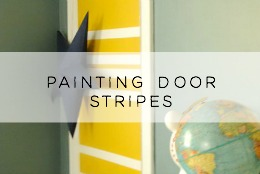 Ok, so on to my pinterest project - painting the interior kitchen cabinets. Here is my "pinspiration" - I'm sure lots of you have seen this cute photo and even pinned it yourself. 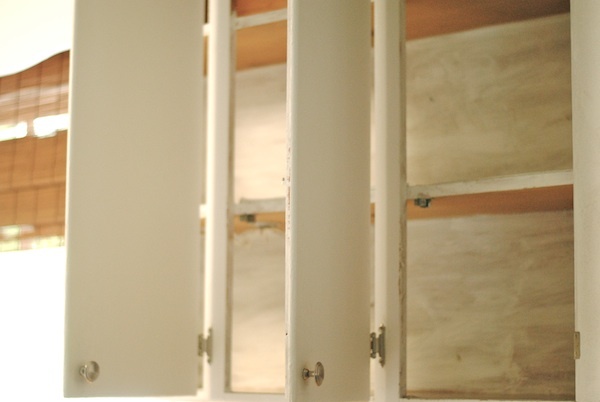 This project is from Elsie and Emma over at A Beautiful Mess. Isn't is so cute and fun? I want my cabinets to look like this. Challenge accepted. Ok - first confession. I'm not as finished as I would have liked to have been. I do have the painting completed just not the cabinets filled yet. 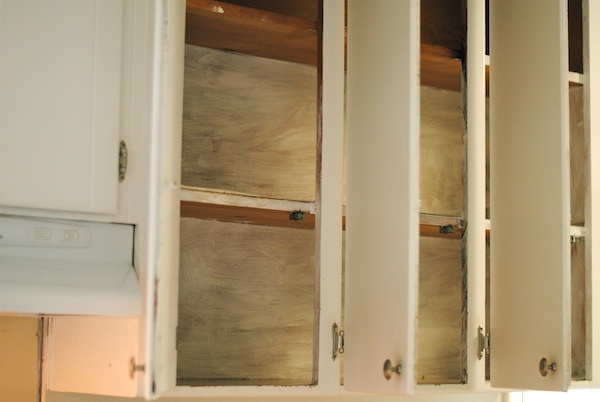 But, I'm getting ahead of myself - let's take a look back (way back) to the original state of our kitchen cabinets when we moved it. Not pretty. Almost immediately the first thing we did was paint our kitchen cabinets. We love them now. They are obviously not new but way better. 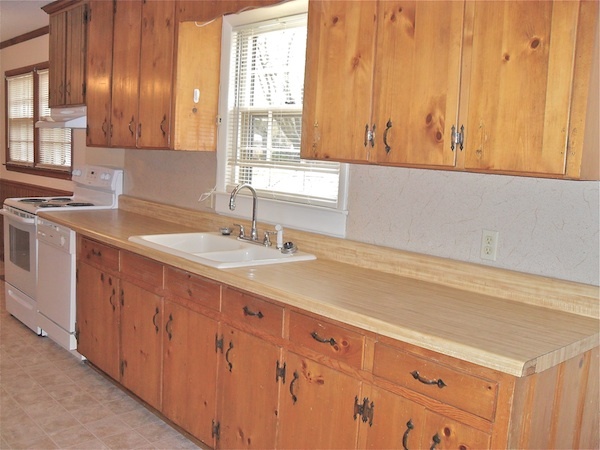 We have debated so many times on what to do with this kitchen. 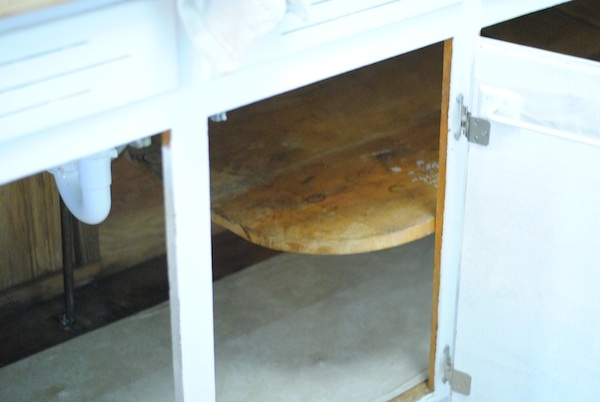 Do we gut the whole thing, leave the cabinets and just replace the countertop - the questions loom. The longer we live here the more we lean towards not gutting the whole thing. 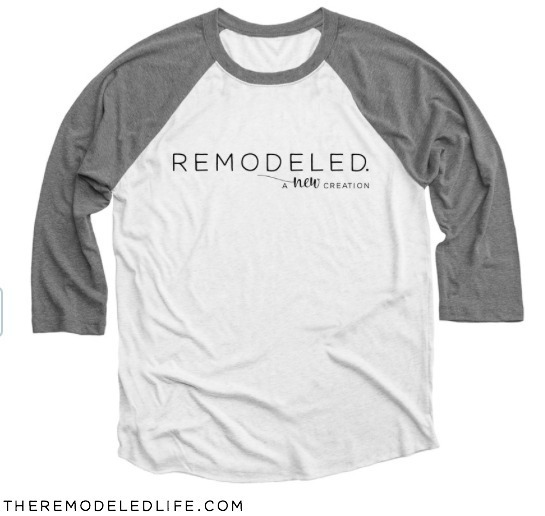 We do however want to replace the the countertops, add a backsplash, take down that weird middle piece over the window, etc. We just don't want to over upgrade our small house. So, those questions are for another day. 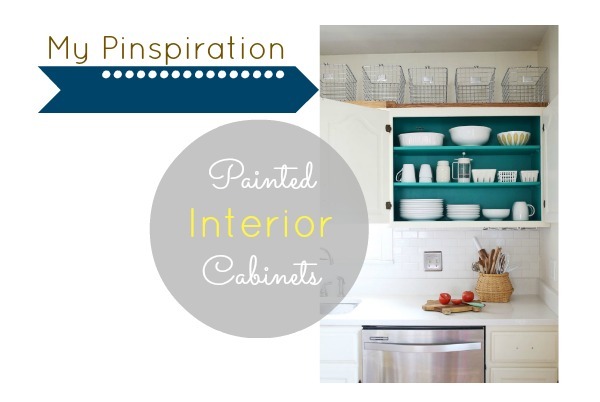 Here's the secret behind those painted cabinets - they are totally crazy half primed on the inside. This was one of those - I'll get to it one day things. Well, the one day has finally come. 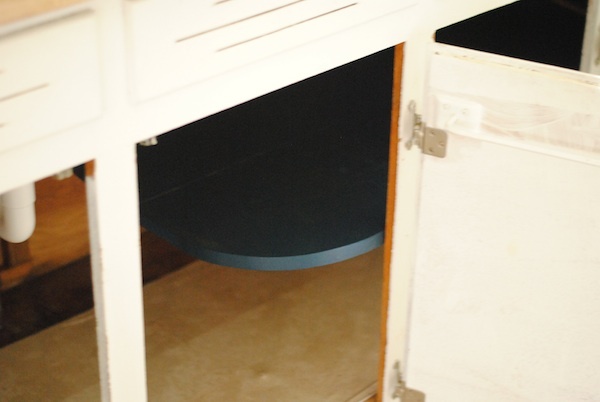 Here's a glimpse at the bottom cabinet - that shelf is old and grody. Don't freak - I had it covered with shelf liner but removed it to clean and paint. So, the color choice. I wanted something fun but not too crazy and something that would be a pretty contrast/background for my dishes and kitchen gadgets. 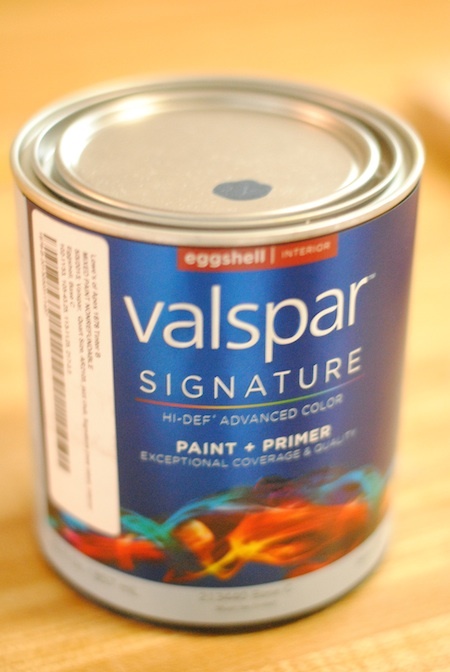 This pretty navy/indigo color by valspar wonderfully named "Jazz Club" totally won. I also loved the quality of this paint - it went on really smooth and nice. I did do two coats but my cabinets were totally weird and half primed so I went into this knowing that would be the case. 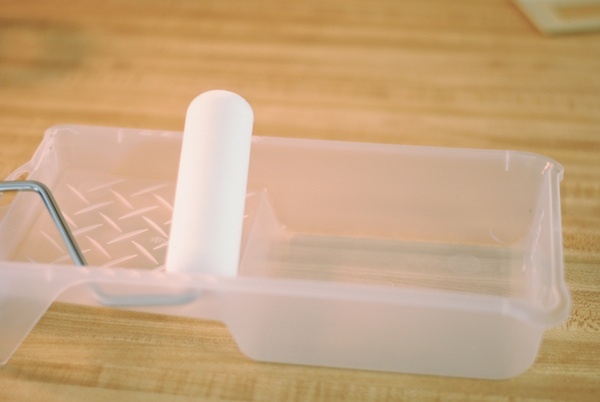 I love using a foam cabinet roller when painting cabinets - the interior was no different. This is my first coat before edging it all out. Its a little brighter here (this is during the drying phase). 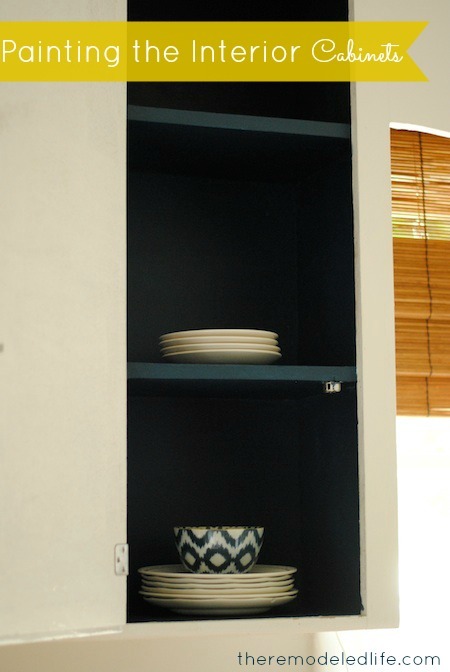 Paint almost always dries a little darker - and this paint is no exception. 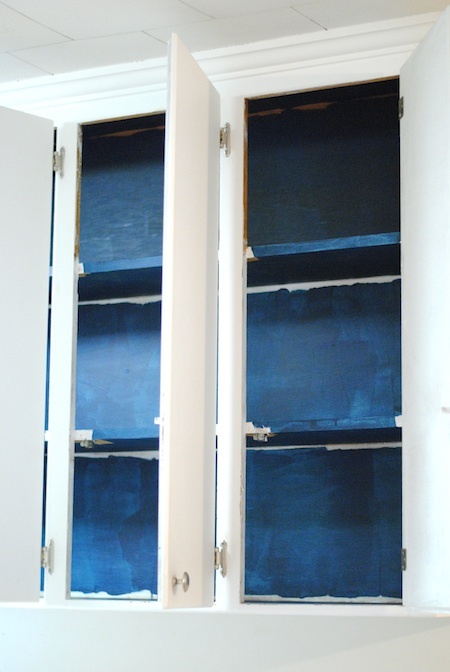 The actual painting of the interior of the cabinets was actually really easy and quick. The worst part about this project was pulling everything out and having your kitchen all over your house while you are in the middle of this. So after two quick and easy coats we have this. I.love.it. I love this color, I love that our cabinets feel finished now, I can't wait to re-stock them and organize them - I could go on. Oh, here's the bottom shelf. I love the pop of navy down there. Now I need to find a really fun and pretty cabinet liner for the bottom. I go by and just open the cabinets up for no reason now to just see the insides. This totally makes me want to replace a few doors with glass doors so I can easily see inside. I still have some white touch ups I need to do and of course - actually filling the cabinets back up. But for now I'm in love. Thanks so much to Katie, Sherry, Emily and Renee for hosting the pinterest challenge! Seriously beautiful! I love all your projects! What kind of paint did you use for the outside? How are they holding up so far? The navy looks fantastic! 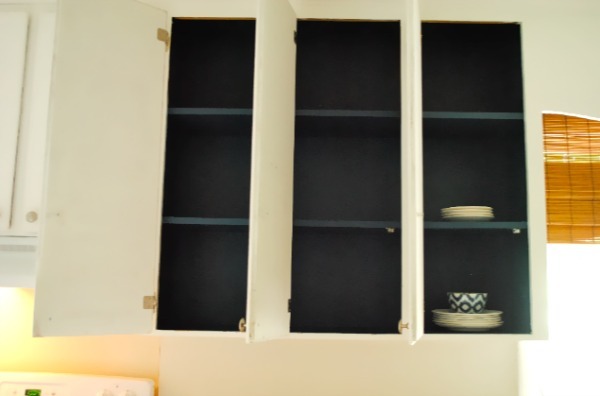 Come paint my cabinets! 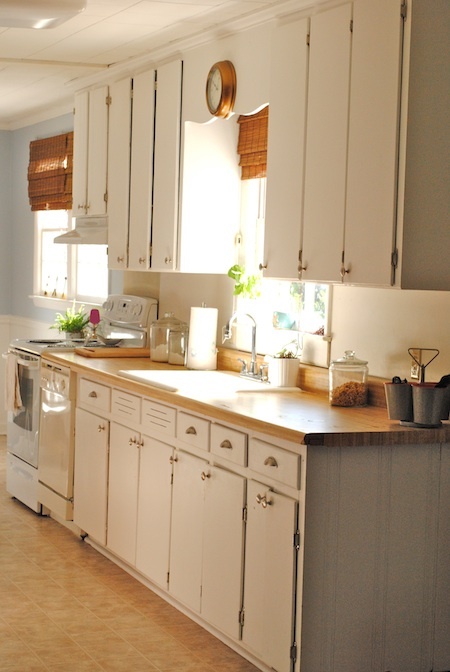 A great option for new counters are inexpensive laminate. Of all countertop options, it holds up better than a lot of more expensive options and it is super-affordable. They even have some really pretty patterns/colors, nowadays (we are replacing our counters and I was pleasantly surprised at the options). Just thought I'd share! Yay! I think you're going to love it so much, you end up taking the doors off. I really like your gold clock, by the way. Oooh they look so NICE!!! I love the color you picked! 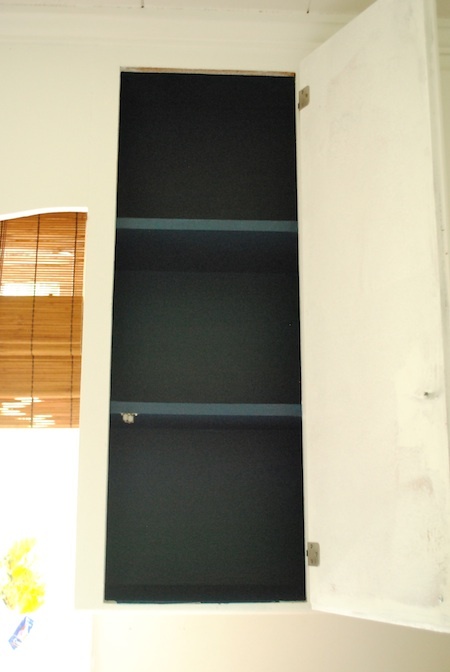 You could totally just remove the doors and it would look amazing with that pop of color! I am so doing this someday. Thanks for the inspiration, Miss Megan! Hope you're having a great week! Good color choice! It turned out great. I always like hidden pops of colors. Love the navy inside! Would you ever consider taking some of the doors off? And I love your pretty ikat bowl! you don't want to close the door and hide it! Absolutely love the color choice and idea, if I didn't have so many colors going on in the kitchen I would definitely try something like this! I love the blog as well, so inspiring and full of faith. I look forward to following it! Thank you so much for the sweet comment Tandra! !